Major fast-moving consumer goods (FMCG) players will soon be able to sell their products via 250,000 common service centres spread across rural India, with the government facilitating the move in view of an ever-increasing demand for such items in villages. Common service centres (CSCs) are points in villages where the government provides a host of services related to ration card, birth certificate, railway ticket booking and money transfer, etc. These centres also train people in using digital services. “With the demand for FMCG products in villages increasing, it was decided to use the vast network of CSCs to sell these products. People in villages can come to these centres and order their products online,” said Dr Dinesh Kumar Tyagi, chief executive officer of CSC e-Governance Services India. A deal has already been worked out with Baba Ramdev’s Patanjali Ayurveda, while negotiations are underway with the likes of Procter and Gamble and Hindustan Unilever, officials said. According to officials, people would be able to come to these CSCs, order the product online, from either the websites of these portals or the marketplace run by CSC, and get the products delivered at home. The backend logistics would be handled by CSC. “The government is focused on the expansion of CSCs because it can transform rural India. With the sale of Patanjali products, door has been opened for popularising e-commerce through CSCs,” said Ravi Shankar Prasad, Minister for IT and Law. Prasad had earlier said services at CSCs would be expanded to support those running them earn extra income. “He (Ramdev) has informed me that in coming four-five years, he will do business of Rs 8-10,000 crore through CSCs,” Prasad had said. According to officials, village-level entrepreneurs (VLE), who run CSCs, would earn commission on the sold products while also enabling customers to get access to these products. 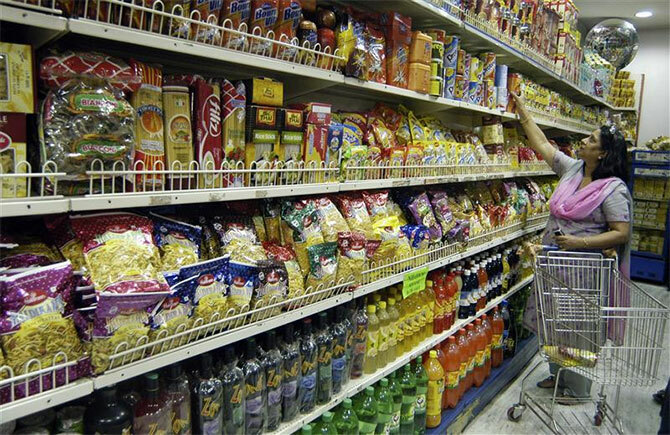 A VLE is likely to earn a commission in the range of 10-20 per cent on FMCG products. At present, CSCs manage transactions worth around Rs 2 crore a day, which the government is hoping to increase up to Rs 10 crore a day. “The tie-up would help FMCG companies do more business. Usually, taking franchise for a brand like Patanjali costs a lot. Here, we, on behalf of the VLEs, try to get the best deal for them,” Tyagi added. According to India Brand Equity Foundation, the FMCG sector in rural and semi-urban India is estimated to cross $100 billion by 2025. The rural FMCG market is expected to expand at a CAGR of 17.41 per cent to US$ 100 billion during 2009–25. Rural FMCG market accounts for 40 per cent of the overall FMCG market in India, in revenue terms. Rural areas also would be the major driver for FMCG, as growth continues to be high in these regions. The government has also been supporting the rural population with higher minimum support prices (MSPs), loan waivers and disbursements through the National Rural Employment Guarantee Act (NREGA) programme.